Round 1 of the FCS (that’s 1-AA) playoffs has come to a close, and the first round clearly favored the home teams. James Madison played host to the tough offense of Wofford, and what a game it was. 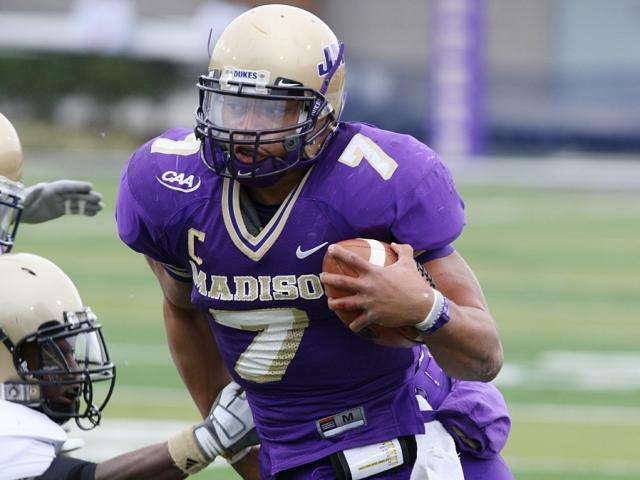 While the Dukes had a hard time containing the triple option Wofford offense, Wofford’s D was likewise unable to contain James Madison QB Rodney Landers, who became just the fifth player in FCS history to rush for 3,000 yards (3,250) and pass for 3,000 yards (3,116). The Dukes also started with great field position every time, starting (on average) on the 35-yard line. Mostly because Wofford refused to kick to JMU return specialist Scotty McGee. It was probably a good plan considering the one time they did, Scotty burned them with a 37-yard return to let the Dukes start on their own 48. McGee also found use on the offensive side of the ball on several long-yard situations due to his speed. The Dukes led by two touchdowns at half time, but Wofford tied the game heading into the fourth quarter. The following JMU drive stalled, and ended in a field goal, 31-28 JMU, with twelve minutes left in the game. Wofford again began to drive, and going for it on 4th and 6 at the JMU 40, the Duke’s defense stepped up and stopped the drive just three inches shy of a first down, causing a turnover on downs with nine minutes left. JMU marched down the field, with QB Rodney Landers and RB Eugene Holloman rushing every play. On 3rd and goal, Landers dragged two Wofford players into the end zone to score what would be the game-winning TD. The last touchdown upped the score to 38-28 JMU, and left a little over three minutes on the clock for Wofford to drive, score, recover the onside kick and score again. The one thing that hurt Wofford is the crowd noise. Normally a shot-gun team, they went almost entirely under center the fourth quarter, and drove down the field, finally scoring a touchdown in 15 plays, covering 56 yards and taking 2:19 off the clock, leaving them with one minute to onside kick, recover, and at least kick a field goal to go to overtime. The entire stadium stood waiting, holding its collective breath as the onside kick went up, and was caught by Bosco Williams to seal the win for JMU. Two knees later and the game was over, final score JMU 38 Wofford 35. So the Dukes move on to round two, facing off with CAA rival Villanova at 3:30 PM on Saturday at Bridgeforth Stadium in Harrisonburg, Virginia.